The IronHorse is a Half-Marathon, 10K and 5K race that takes place on the Wapsi-Great Western Line (WGWL) Trail located in Riceville, Iowa. The WGWL Trail has a Northern Branch and a Southern Branch. The race takes place on the Rails-to-Trails recognized WGWL’s paved and concrete laid Northern Branch. The Northern Branch is the official interstate trail connecting to Minnesota’s Shooting Star Trail. The WGWL Trail is the first connecting recreational trail between the Hawkeye and North Star states. Safety is paramount. The race is located on a dedicated recreational trail. Shuttles provide racers transportation to the starting points (Half and 10K). Aid stations and port-a-potties are located along the race route. The finish is at the WGWL Trailhead Welcome Center in Riceville, Iowa (110 Main Street). Scenery is extraordinary. Rural and quiet, yet full of American beauty like cattle grazing, Amish farming by horse and hand, modern energy advancements in the form of a 30+ wind turbine farm, a 240 acre Oak savanna, a wetland boardwalk, the small village of McIntire, and the wide expanse of farmland being planted in May. Awards given to the first three finishers in each gender in each race. All Half Marathon registrants who finish will receive a finishers medal. Lodging is ample and variety abounds. Riceville has four lodging establishments and a campground with 80 campsites, modern showers and bathroom facilities. Surrounding communities offering additional hotel options. Racers without lodging are welcome to use the Lake Hendricks showers following their race. Why Iron Horse? The IronHorse represents the abandoned railway corridor preserved by the WGWL Trail as well as the industrial power and revolution the railroad brought to America. The railroad actually hauled iron ore in this area as well. 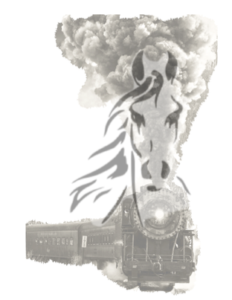 IronHorse proceeds directly impact nature preservation and restoration, trail maintenance and enhancements. Thank you. This is a race. For the safety of all involved, no strollers please. Individuals with a physical disability may participate using a hand-cycle (a one-minute lead start will be given to ensure freedom of movement for all racers). Thank you.